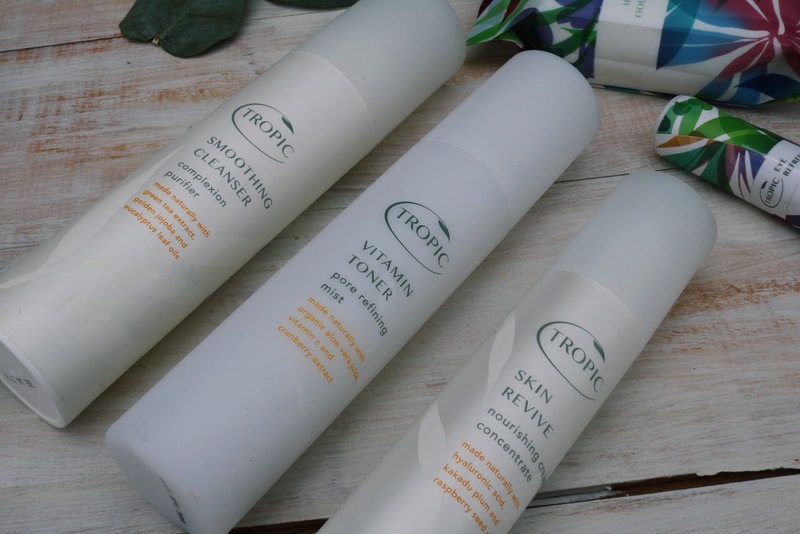 Having started to go natural with my skincare and toiletries, I came across Tropic last year through a friend. The first element of my routine I was trying to change was my face care, so naturally, the first products I bought were the Smoothing Cleanser, the Vitamin Toner and the Skin Revive to fill the place of my usual 3-step routine. 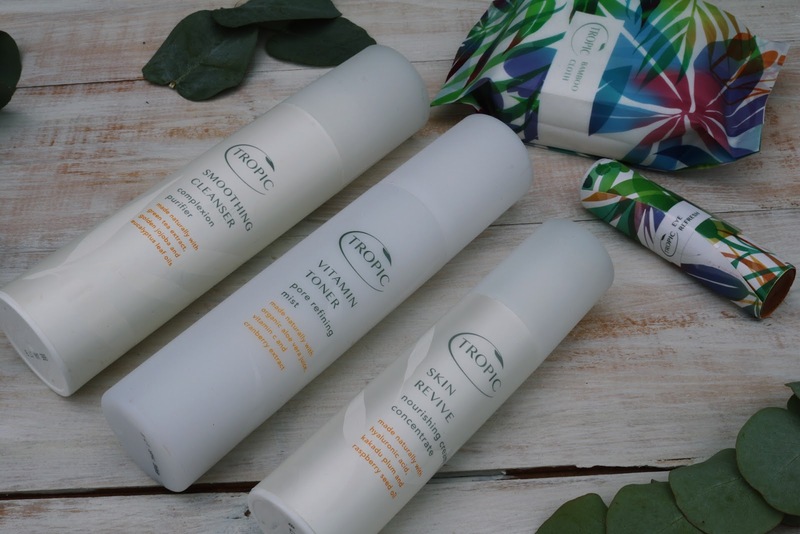 It’s more than likely that customers will purchase certain products to use together, so Tropic has created certain collections with products such as this. For instance, those three products come in a collection along with the Eye Refresh and save £15 in the process (essentially you get the eye refresh free). The Smoothing Cleanser is the first step in the ABC face routine. The cleanser contains Golden Jojoba oil, Sweet Almond oil and Avocado oil giving a refreshing blend for clear and soft skin. The texture is milky and smooth to apply, and it quite literally melts away makeup in the gentlest of ways. To use you simply massage 2-4 pumps onto dry skin in gentle circular motions. This will remove any makeup or impurities on your eyes, face, and neck. To remove, rinse off with warm water using the bamboo cloth. If you use this to remove makeup it’s recommended to use another 2 pumps to cleanse your face after, and remember to give your bamboo cloth a good rinse after removing your make up. The Toner is probably the most refreshing product I have ever come across. With a mixture of Rose Water, Cucumber, and Aloe Vera Juices it is perfect to calm, rejuvenate and minimise pores. After using the cleanser, just spritz the Toner across your face and neck, and leave to sink in. You can also use a cotton pad to wipe around the face, it’s just as effective either way. With a blend of Rosehip oil, Golden Jojoba oil and Aloe Vera Juice I can see why this product is labelled as nourishing. Skin Revive is hydrating and moisturising on your skin, whilst also being gentle and giving a radiant complexion. Use 2-3 pumps onto face and neck in circular motions and leave to absorb. In a rollerball applicator, the Eye Refresh is easy to apply for that little pick-me-up or when you need to look wide-eyed. The cooling blend of Cucumber Juice, Aloe Vera, and Ginseng makes the mixture perfect for calming puffy, tired skin and dark circles. This little bad boy has quickly become an essential to not only keep on me when I go out but also when I’m studying or just lounging around the house. To use, simply roll under eyes as much as you require. I love each and every one of these products. All of them work so well together but also have such strength as individual products. Whenever I have come across natural products in the past they have often been way out of my price range, so it’s incredibly refreshing to come across natural products that are not only within my budget but also effective and match my own ethos. 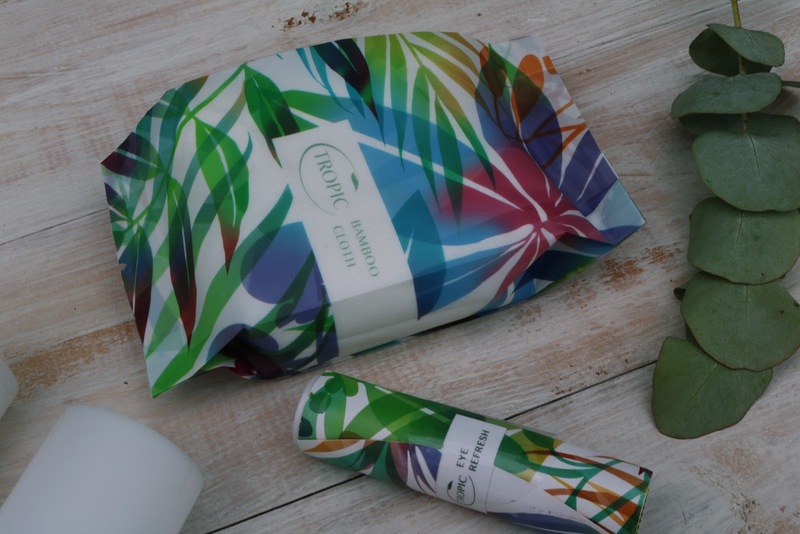 You can read more about Tropic and their brand here. Have you ever tried Tropics?